Phil Myers, a native of Elkart, Indiana, has been principal horn of the New York Philharmonic Orchestra since 1980 and a member of the New York Philharmonic Principal Brass Quintet. He frequently solos with the orchestra and and at other venues and has recorded as soloist and with members of the horn section. Phil started piano at age 8 and horn at age 9. He studied with Frank Brouk and Dale Clevenger, then with Forrest Standley at Carnegie Mellon University (on Clevenger’s recommendation). 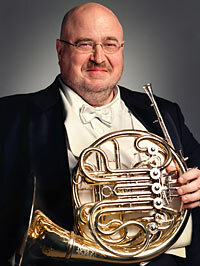 He was principal horn of the Atlantic Symphony in Halifax, Nova Scotia (1971-1974), third horn with the Pittsburgh Symphony (1974-1977), and principal horn of the Minnesota Orchestra (1978-1980) before joining the New York Philharmonic. Dennis Brain and Myron Bloom were early influences. Phil is currently a faculty member at Mannes College, New York University, and the University of Music Lausanne in Fribourg, Switzerland. At one point he owned 17 instruments; currently three or four. He was known for playing Conn 8Ds for years, but later switched to an Engelbert Schmid triple horn. Phil was elected an Honorary Member in 2014 at the IHS Symposium in London, where he and the New York Philharmonic horn section performed a recital and the Schumann Konzertstück.